MapleMBSE is an Excel-based tool that makes it easy for every stakeholder to engage with the Systems Engineering (SE) project without requiring them to be an expert in your primary SE tools. Systems engineering projects are much more likely to succeed if every stakeholder can easily contribute to the process, but most people don’t have the training needed to use “traditional” SE tools. MapleMBSE makes broad engagement possible with Excel-based, task-specific interfaces for each activity in your SE project. By giving all stakeholders access to the process through a live, two-way connection to your systems model, you can ensure that all stakeholders can collaborate through the systems model, allowing them to work faster, avoid errors, and reduce unbudgeted costs. 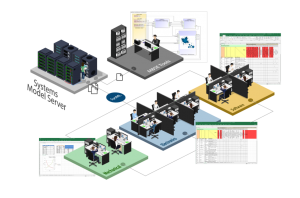 MapleMBSE is an Excel-based tool that makes it easier to get every stakeholder involved with your systems engineering project.